I am happy to write that for a third year now OLIS brought together a cross-campus group of faculty, staff, and administrators. A record-setting 143 people attended the event supported by eight UA divisions (listed below). 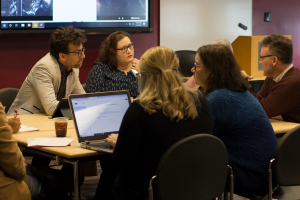 The objective of OLIS is to spark conversations about online teaching and learning through good surroundings, informal breakout sessions, and keynote presentations. A combination of good food and coffee, along with the Bryant Conference Center, had everyone feeling ready to talk. 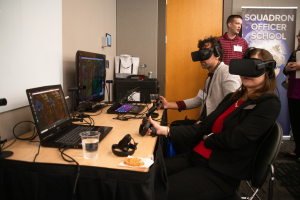 And the keynote guests from the Squadron Office School from Air Force University (Maxwell AFB) explained and demonstrated how virtual and mixed-reality simulations augment teaching effectiveness. I was among the guinea pigs who demonstrated the Mursion simulation to the group. The first scenario had me navigating interpersonal conflict in an office, and the second had me teaching Romeo and Juliet to a virtual middle school class! The conference center and the keynote served as excellent bookends for the breakout sessions. Each of the ten breakout sessions had a facilitator and a note-taker. As a result, the notes from each session are available for perusal by University of Alabama employees through UA+Box. All ten breakout sessions are in this folder. Special thanks go to the divisions that supported our 2019 effort. They provided the people for our 19-person planning committee, as well as vital support to make all the material arrangements possible. OLIS 2021 will be on February 5th. If you want to know more, please contact me or Cheryl Bosarge.